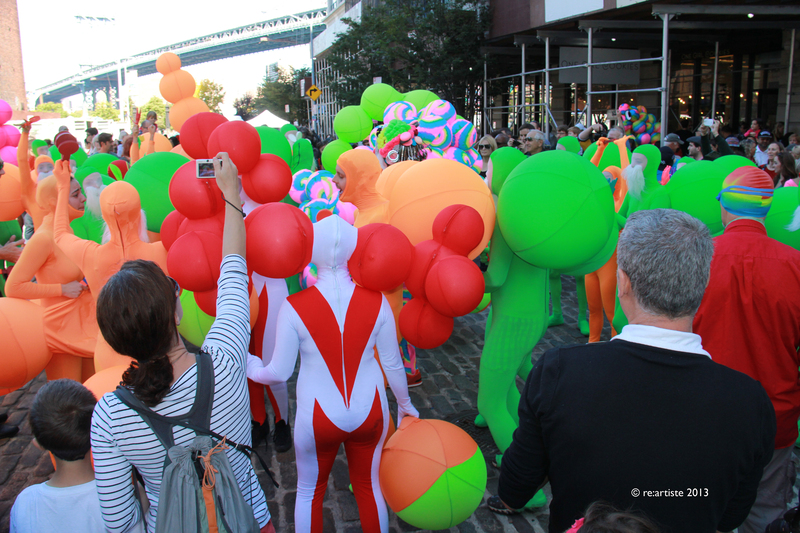 September 28, 2013 – Pier 1 under the Brooklyn Bridge is full of wonderful orange creatures dancing and greeting the public – this is the second day of DUMBO Arts Festival. 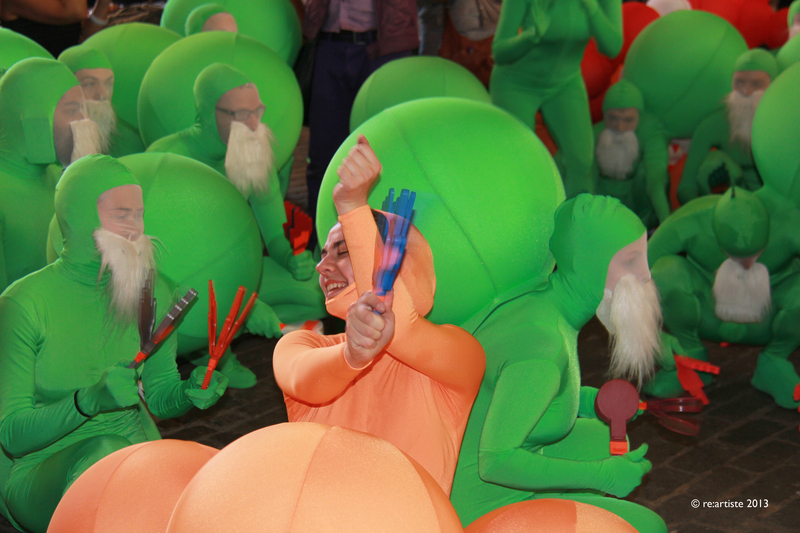 But who expected to see the moving, mysterious creatures among the traditional artworks and performance scenes?! People are staring, stunned. 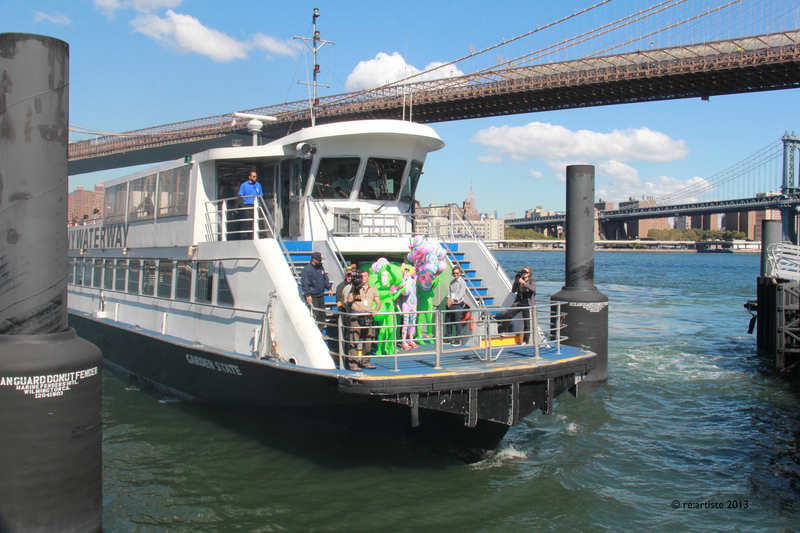 And here we go – even a bigger surprise – an old good East River ferry docking, full of boisterous green bodies triumphantly arriving in Brooklyn by the river! 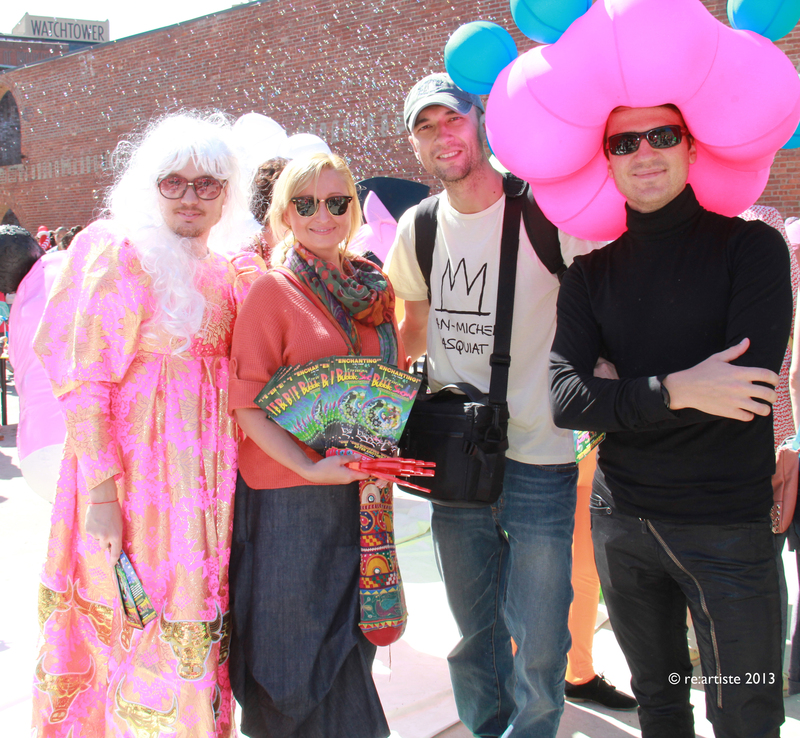 This colorful procession was marching through the streets of DUMBO during two hours cheering people and shouting “Don’t give up!” The leader of this unprecedented art procession is Andrey Bartenev, international artist, sculptor, experimentalist renowned for his provocative, interactive installations and performances and bizarre and unexpected costumes. 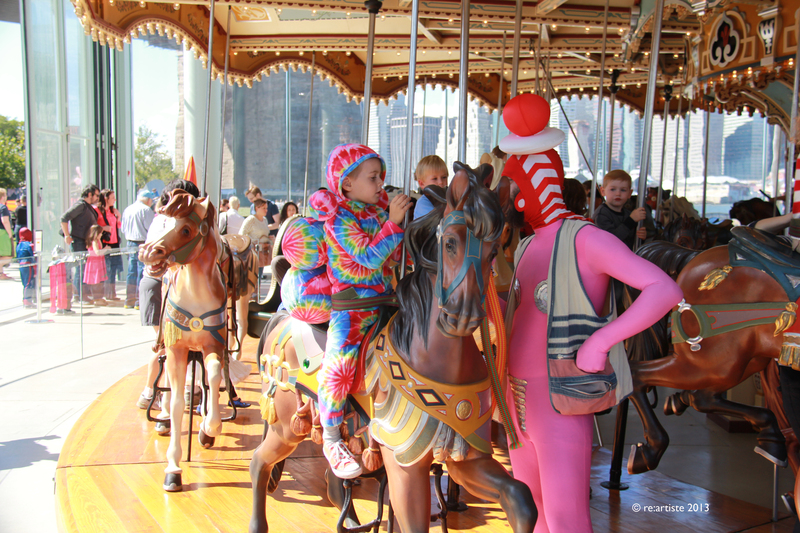 But should you talk to him you quickly realize that he is not just a genius clown but a philosopher, whose main theory-turned-to-be-a-practice is LIVE HAPPINESS. “Our need to be happy and our dreams of love are the basis for the existence of human race and the most delicate connection between all beings. The importance of happiness is above religion, politics, social agendas or economic needs,” – Andrey Bartenev explains. The art procession was a blast! 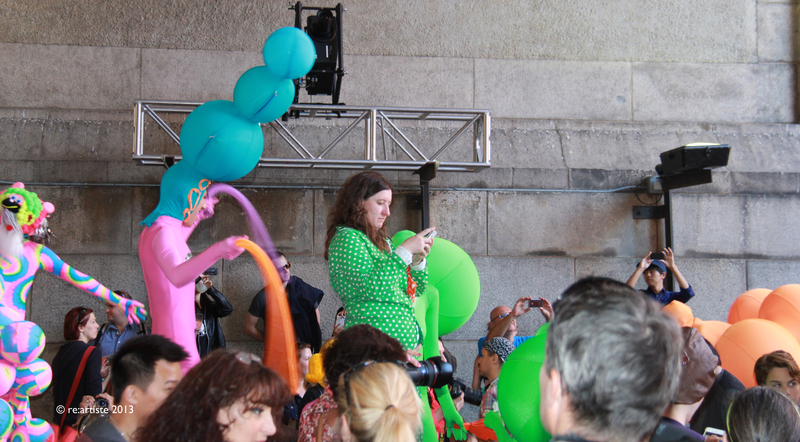 Those live “bubbles” – bright colorful creatures – Bubbles of Hope – were marching and dancing accompanied by live music. It looked like a true a ritual, a collective meditative act, which aimed to strengthen our own abilities to enjoy life, dream, and hope, always. 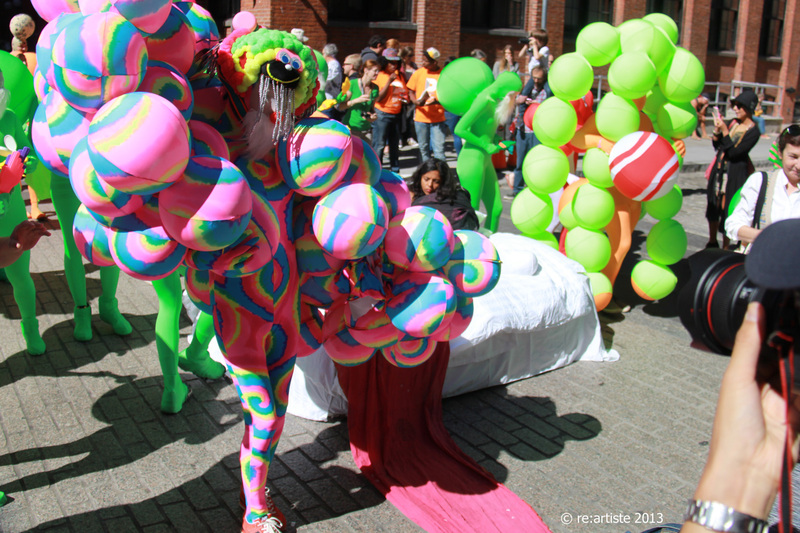 Andrey Bartenev, a charismatic artist, led the procession through the streets of DUMBO to the famous Jane’s Carousel and then Tobacco Warehouse pavilion where the party culminated with dancing surrounded by real bubbles, catching the sun rays and creating the rainbows. 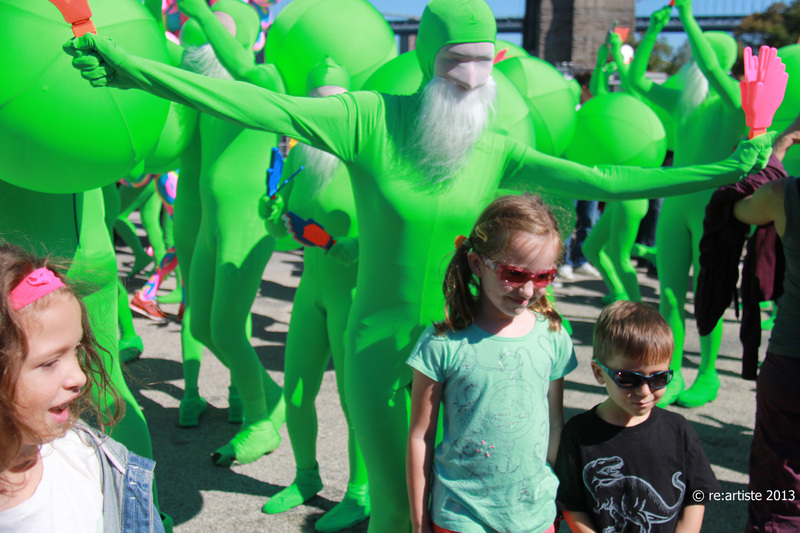 This was an urban fairy tale, a landing of colorful aliens carrying joy and calling you to dream and hope. The art procession was designed and performed by Andrey Bartenev, with performances by 60+ artists, and directed by Mei Ann Teo. Produced by Unicycle Productions. re:artiste is proud of having marketed this project. Sonia Clark of Unicycle Productions, sending pictures to the World!